Cozy up by the fire in Autumn. Watch the snow fall from the window in Winter. See the mountains come alive in Spring, or head out on the lake in Summer. Everyday is perfect for an overnight in one of the many Ellijay, Ga cabin rentals dotting the mountainside. If you’re heading north to sample the wines, hit the bike trails, scour the antique shops, or lounge at the lake…you need a place to rest your head for the night (or the weekend!) Check out our list of favorites below, and tell us your favorite overnight option in Ellijay! Blue Sky is a trusted property management company that has been serving Ellijay, Ga and visitors to the mountains since 2004. Their in-house reservation team is available 7 days a week. All cabins listed with Blue Sky have minimum amenities, which include non-smoking rentals, wi-fi, gas grills, hot tubs, a washer and dryer, and a fully-equipped kitchen. Many cabins have even more! Here are two Blue Sky Rentals that really stood out to us! The Cartecay is one of north Georgia’s top Kayaking/Tubing/Canoeing rivers, and you can rent canoes, kayaks, paddle boards and tubes at this property. There is a footpath right off the driveway that leads you to the trails of the Rich Mountain Wildlife Preserve – great for biking, hiking or fishing. If you’d rather relax, then pour yourself a glass of wine on the brand new outdoor riverfront living area, which includes a gorgeous wood burning fireplace and cozy seating area. On the deck off the Master – another fireplace…right next to the hot tub! And down by the river…a fire pit perfect for roasting marshmallows. Let’s go inside now…three bedrooms and three baths make this great for any size family (or multiple families.) There’s a fireplace inside, too! At night, after you take a dip in the hot tub, meet the kids in the lower level game room. It’s loaded with card tables, bumper pool, and more. Looking for the best place for your next family and friends escape? Inspiration Point sleeps 10 people over five bedrooms, and it is ideal for gathering multiple families or extended relatives. 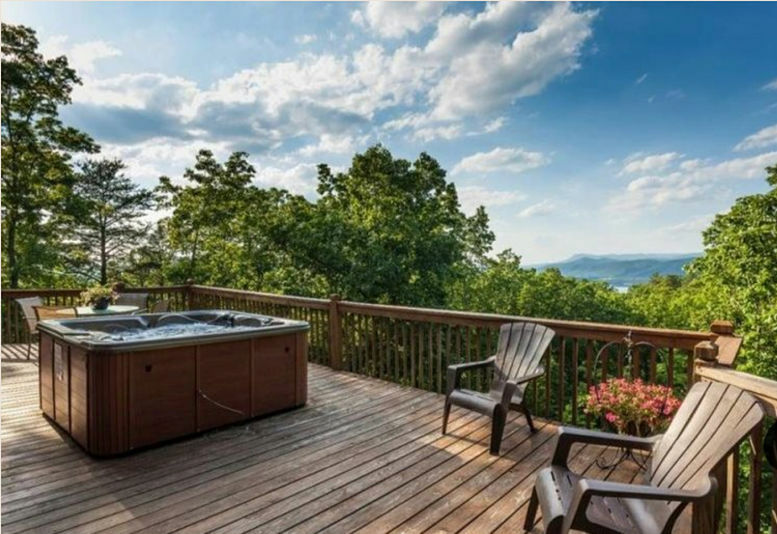 This rental is perched on the side of a mountain overlooking Fort Mountain State Park and Carters Lake, with views that will take your breath away. And the best way to see them? From the oversized deck, inside a luxurious hot tub. Kids will adore the room with double bunk beds, as well as the game room downstairs which includes a new pool table, foosball, and a large TV. Cook up a lovely dinner in the gourmet kitchen, which is open to the living room with a fireplace and floor-to-ceiling windows showcasing the mountain views…and then head outside to the fire pit to roast marshmallows in the evening. The owner of Morning Breeze has been in the cabin rental space for 15 years – she knows her stuff. It’s also helpful to know that all Morning Breeze offers are pet-friendly cabin options! The full list of rental options: Morning Breeze rentals in Ellijay. Here is a Morning Breeze rental that really stood out to us! This gem sits just a few yards away from the picturesque Lake Buckhorn, with gorgeous trees along the perimeter and a fully stocked supply of fish. Besides enjoying the lake, you can take a leisurely walk on the Griffin-Thrasher Trail hiking trail, a 3.5-mile “easy” trail that winds along Jones Creek and offers great views. You can also take out the kayak or one of several canoes that are complementary with the cabin. Need more outdoor ideas? Roast marshmallow at the fire pit, enjoy horseshoes, lounge in the hammock, and enjoy the view from several decks – including one with a sunk-in hot tub! Yet another great rental company that’s been around since 2004, Mountain Oasis is committed to being a great communicator with those that are renting, and another favorite of those heading to Ellijay, Georgia. Here is a Mountain Oasis rental that really stood out to us! This 3,600 square foot Craftsman styled rental includes a private lake with a mountain setting. Take out the paddle boat, or lounge on chairs at the dock. The terraced patio level includes a great view and a hot tub! Inside, the decor truly says this is one of the mountain’s amazing luxury homes. We love the spiral staircase and wood-burning fireplace in the family room. There is a screen porch also overlooking the lake and a master on the main level. Up in the loft you’ll find twin beds, perfect for the kids…and the media room below includes surround-sound, theatre seating, and a pool table. There is also a second master suite and kitchen on this level. Dragonfly Dreams specializes in luxury cabin rentals, from one to four bedrooms, specifically in Ellijay. And their pet-freindly mountain cabins? Love that they welcome your pet with a dog bed and pet bowls…just be sure to bring a crate so they don’t roam while you’re away. Here is a Dragonfly Dreams rental that really stood out to us! This spectacular pet-friendly cabin sits on Turkey Creek and is only moments from two of Ellijay’s delightful wineries, making it a great escape for a couple or a girls’ weekend getaway. Heading here in the Fall? This cabin is only two miles from the “Apple Highway,” making it an ideal location to enjoy the Apple Festival. There is outdoor dining options (on the porch,) a fire pit for roasting hotdogs, and the coolest round hot tub. This rustic retreat has an interior with clean, modern lines and plenty of light. We adore the selection of toys, games, legos and puzzles for kids. The loft has two recliners, bean bags, a kids play tent as well as a kids’ kitchen. And the second bedroom has two double beds – bunks! The screened in porch is perfect for coffee or breakfast, and the fireplace is what you need on a cozy winter evening. The neighborhood also includes creekside picnic tables, a pool with a view of the mountains, tennis courts and more. The cabin is inside a gated community, Walnut Mountain, with easy access to the apples and parks and more. This chalet with six beds is within Coosawatee River Resort, which offers hiking trails, fishing, canoeing, river floating, white water rafting, horseback riding, plus indoor and outdoor pools! Whew! The lake in front of the house is fully stocked with fish during all months of the year. The cabin is on 2-acres, so running into the neighbors is almost out of the question. Grill steaks for al fresco dining on the patio, with fantastic views…or lounge in the Master sitting area, with a stunning rock fireplace. 5 bedrooms, 6 beds, 7 acres of privacy backing up to 500 acres of unspoiled wilderness. Wow! Luxury touches can be found from one end of this space to the other. There are games for everyone, so why not host a tournament of pool, foosball or air hockey, or play one of the many board games. The media center boasts a 50″ HDTV screen with surround sound. An Xbox Game Console and a PlayStation Game Console with over 50 movies and video games ensure endless entertainment. Step out onto the patio and enjoy a soak in the spacious hot tub or cozy up to the fire pit and enjoy s’mores and telling stories as the suns sets over the mountain. The wrap around deck featuring comfortable seating around a granite fire table is a great conversation place. An outdoor playground with rock climbing wall, swings, and pirate fort is also available for the little ones to enjoy nature’s beauty. The site has several walking trails and is a certified wildlife habitat with the National Wildlife Federation for the naturalist at heart. Spending time at Mountain Song Cabin is like living in a cabin treehouse where nature abounds. Perched on a summit overlooking your own forest with private hiking trail, you can expect nothing but relaxation, rest and rejuvenation. A firepit, hot tub, indoor fireplace, and plenty of privacy! This dog-friendly, all-wood Ellijay cabin is for you, if you;re looking for a great mountain experience. Situated in the midst of the stunning North Georgia Mountains, and moments from the town of Ellijay, this spacious abode is the ideal retreat for a memorable getaway! Sleeps six from $90/night. Owners Fabrizio and Jeffrey are impeccable hosts, and would welcome you with open arms. They are also super story tellers, of a life before this one which included too much work and not enough travel – and how life has changed for them in the best possible way. This is an amazing place to escape. Also on the property you’ll find a spectacular vintage airstream with a renovated interior, a spacious porch and patio with a fire pit, and the most spectacular Japanese soaking tub. The bathroom also includes a private flushing toilet and a glamorous outdoor shower. One of our most memorable date night escapes was staying in the Artist Cottage with a private outdoor tub under flowering vines, sitting on the property of the Martyn House. In addition to this spectacular cabin, you can select from a number of European yurts (each one is different, but you can see the basic layout above) or a room in the Farmhouse BnB. It sits on more than a dozen acres, with a garden for roaming, a pond to relax by, and several trails. It is an adult-only accommodation, and extremely romantic. With a garden on the side yard and chickens in the back, you know breakfast is going to be great! Alex prepared a feast fit for a king (and queen!) with bacon, eggs -from the onsite chickens of course – fried potatoes, pancakes, and delicious coffee. Did you know Ellijay was named Mountain Bike Capital of Georgia? If you have a passion for biking, this is where to be. Mulberry Gap Retreat is close to a number of great biking trails, and they offer shuttle services should you need it. While you’re here you can camp or snag a cabin – both private and group options available. Build a fire, grab a beer, bring Fido, and meet new friends that love the outdoors like you. If you’re new to the area, you might even want to set up a group or private guided tour. These folks have everything you might need – except a bike! If you don’t have your own, you can rent one in town at Ellijay. One more thing – food! There has been nothing but rave reviews about the meals here, and with no surprise since everything is fresh and brought in. Take a look at the sample menu here. Why is the bill higher than I expected? Just like a hotel, cabin rental companies must also pay hotel taxes. That means you will be charged the state and county taxes for your accommodations. In Ellijay, that’s 12% total. It is also customary to add a cleaning fee (usually about $100 or so, depending on the property size) as well as a processing fee and a guest service fee. Service fees generally pay for the service that posted the cabin (the cabin property company, AirBnB, TripAdvisor, etc.) That’s how those companies make money; it’s generally 6-12%. The processing fee, sometimes called booking fee, is to cover the credit card fees. Some places also require a security deposit. If so, be sure to ask what the guidelines are about receiving a refund on that fee, to make sure it is refundable and under what circumstances it is not. Not every rental company charges all of these fees, and it’s always important to ask first. What if I want a fire in the fireplace during summer? Unless it is a gas fireplace, most places will not allow you to build an inside fire in the warmer months. Dates can vary, but in general here in Georgia, those dates are October 1st – Aprl 1st. If this is important to you, make sure you ask about it beforehand. Also, find out if the firewood is included in your stay, and if so, how much. I want to bring my pets. Cool? Most cabins only allow dogs, if any pets. Generally there is security deposit required, and some rentals also charge an additional fee. Remember to also bring a crate. You are probably bringing Fido with you on the trail, but if you want to visit a nice restaurant or hit the grocery store, you don’t want to let them roam the house. That’s how trouble happens. My phone will work, right? It really, really depends on your carrier. My personal experience is that Verizon works better in the Ga mountains than most carriers. The truth is, you can’t depend on it. Most vacation rentals offer wifi, though, so you can still connect with civilization…in fact, some cabin companies require a landline in the rentals to make sure you always have connection in case of an emergency. Bring it to take a picture or two…but I know you’ll love the mountains so much more if you keep email, voicemail, and texting at home. Unplug and then reconnect. With Mother Nature. PS – because of that, don’t depend on your phone GPS either. Most of the time the directions are wrong anyway. Ask your cabin host for turn-by-turn directions. How do I get a deal? You’re probably not going to find a deal with TripAdvisor or AirBnB (though, if you use my link here, you can earn $40 credit on your first rental.) But with cabin rental companies, there is usually some sort of special running. Check out there website for offers like upgraded packages or discounted nights. What is a lock-off room? Sometimes you can rent a large space for an affordable rate because there are lock-off rooms. For example, you might get a discount by renting a 5-bedroom cabin for a small family. They are able to save on cleaning by “locking” three of the bedrooms, for example, so that you cannot enter and use them. Don’t worry – no one else is staying there. It just keeps the price down for you and for the person renting the cabin. Will I see a bear? No one can guarantee you will or will not see a bear. But look, this is the mountains – it’s not the zoo. So chances are that you WILL see wildlife. Real wildlife. So be cautious and alert, and whatever you do, avoid approaching any wildlife. Depending on the time of year, there may also be mosquitoes, spiders, snakes, mice, yellow jackets, and other creepy crawlies. It’s the mountains, ya’ll. Enjoy it and embrace it. And pack some bug spray. First, always check the FAQ with your rental company or listing because nothing is ever standard. But – generally – the place will have sheets and towels, toilet paper and paper towels, dish clothes and pot holders, and trash bags. You always want to bring your own food. Most cabins have nothing – not even condiments like salt. Bring your own coffee, and pre-grind it because most have no grinder. I always bring filters, too, because coffee is important. If you want to use the grill, you will need everything for that (unless it’s gas.) We also like to bring kindling and newspaper for getting the fire pit started. And a lighter, because finding out the one there is out of lighter fluid is very disappointing. Other things they MIGHT have, but you can never be too sure….a wine opener and single-use supplies of laundry detergent. What do we do when we’re there? Oh. My. Gosh! There is so much to do….hiking, biking, dining, apple picking, horseback riding, antiquing… visit the wineries, go fishing or kayaking, try tubing on the river. Visit the Bigfoot museum, or explore one of the nearby state parks. Saunter through downtown…or just sit on your cabin porch with the fire roaring and a glass of wine in your hand. Disclosure: We are so happy to work with the Gilmer Chamber to bring you our favorite overnight destinations. While this is a sponsored post, the opinions here are genuinely our own. Additionally, there are a handful of affiliate links in the post, which costs you nothing but helps us buy a cup of coffee. 1 Comment on "17 Ellijay, Ga Cabin Rentals & Overnight Options To Die For (+ insider tips)"
The north Georgia mountains have some great vacation spots with really nice spaces with awesome views.